Thanks to VaccTek, our onions have never been this dry! Condense drying, how does it work? Every year, when the onion harvest comes around, people start deliberating over the best way to store them. What are the risks? How should they be dried? The first few days of storage are crucial, especially if the onions are harvested and unloaded during relatively high temperatures (from 25°C upwards) or fairly heavy rain. A mixture of high temperatures and heavy rain can sometimes be seen in temperate climates, and is commonplace in the tropics. Not being prepared for these conditions can reduce harvests by between 20% and 80%. Damage caused by Erwinia sp. Heavy rain and high temperatures raise the risk of bacterial infection. The Erwinia carotovora and Pseudomonas alliicola bacteria, highly prevalent in the atmosphere and in soil, are carried in raindrops, and when these raindrops splash onto a plant's leaves, the bacteria seep into the plant mostly via openings and pores. Throughout a plant's entire lifecycle, bacteria continually seep into it, travelling down its leaves to the neck of the bulb. Stem or neck rot, «koprot» in Dutch. 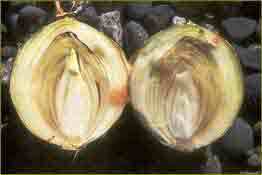 The same thing occurs with the spores from the Botrytis aclada fungus; the cause of neck rot in onions. Hence, onion bulbs must be harvested as early as possible and at the right time; usually when half of the plant is still green. Many farmers leave the plant to grow when it reaches this stage, thinking that by doing this they will increase their harvest by several tonnes. They are right in one respect, it will increase the quantity of their harvest, but not the quality; it is far better to harvest earlier. A research study carried out over several years by the Dutch institute PPO demonstrated that leaving onion plants to grow, raises the net weight of the harvest by 7.1%, but after drying, this rise drops to 1.1%. 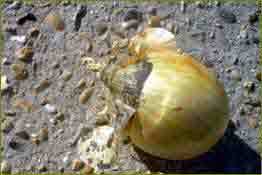 Drying onions requires exposure to dry air, or rather, air with very low relative humidity (RH). The urban myth that if onions are dried quickly, the neck seals off, allowing moisture to build up inside the bulbs and effectively cooking them, is just that, a myth. The level of rot is determined by when an onion is harvested and topped and how quickly it is dried, given that these two factors can drastically reduce the number of bacteria that enter the bulb and how long they have to multiply inside it. 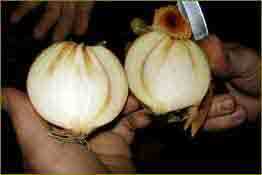 Unfortunately, onions tend to be ventilated using ambient air, which is occasionally heated by a few degrees. This is of course better than leaving onions out in the field, or piling them up in a closed store house to dry, but in these conditions, bulbs take 10-14 days or longer to dry properly. Drying is complete when the neck can be rolled between the forefinger and thumb. During these 10-14 days, the neck-rot causing bacteria and fungi have plenty of time to permeate the bulb, start spreading and spoil it completely; whereas if the onions are dried within the space of 5 to 6 days, the bacteria and fungi barely have time to even break into the bulb. Furthermore, the day-night temperature variation (often more than 4°C) allows dew to seep into the bulb. However, closing the windows of the store house increases the risk of green mould (Penicillium), which tarnishes the onion's skin. Conclusion: Moist onions lose a considerable amount of quality within just one week. It is advisable to fully dry them out within this space of time. What are the risks? How should they be dried? Using outside air, using heaters, or using condense drying? And, at what temperature? This article focuses on an essential part of the storage process: drying. We look at the various techniques that can be used and how they really affect an onion's moisture and its quality. Adapted from an article written by Evert Steenge (agricultural consultant, specialising in onions) and Huub Kasius (Managing Director of Agrovent -- Innovation in Storage). Note: with respect to the drying of onions we will use the word to ''dry'' and not to ''cure''. Curing (or better said wound healing) you do with potatoes at 15°C and with a very high relative humidity. Onions you have to dry and ... fast!